Who is in favor of the Regina restriction? We had three panelists from Saskatoon and two from Regina. Only one of the five individuals on the panel spoke in favor of the restriction. The primary goal as I understand it is to create a vibrant city centre. Has that been achieved in Regina? I certainly don’t see it. Within Regina’s office market, 82 per cent is downtown and 18 per cent is suburban. Saskatoon’s picture is much different with only 68 per cent of the total office space downtown and 32 per cent suburban and yet Saskatoon’s core is far more vibrant than Regina’s. Drive around Regina’s city centre and you’ll see what I mean. They might have one block that could be considered a retail zone for smaller merchants whereas Saskatoon has at least six that form the heartbeat of the city. Only one individual spoke in favor of the restriction. 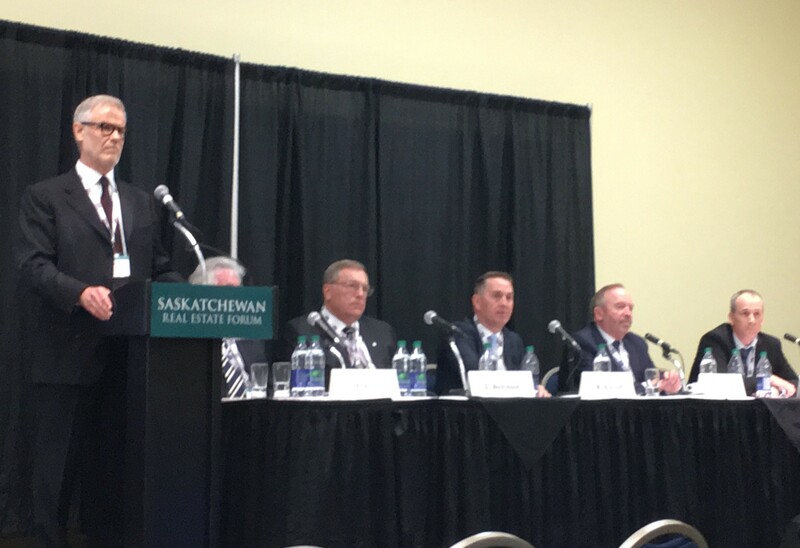 It’s actually difficult to find people in the commercial real estate industry, knowledgeable about the Regina office market who will speak in favor of the policy. How do you really create a vibrant core? Using Saskatoon as the example, it’s just not about office. I frequently use my real life example of several times needing to drive around the block at 7 PM in the -30 C dark dead of a winter night before I can find a parking stall. It speaks to the vibrancy our Saskatoon’s downtown. Let’s stop the nonsense of talking about limiting where offices can be built. Let’s instead create incentives for a grocery store to build in the core area and attract high density multi-family development. Look at the great city centres of the world, where you have high density living you find a dynamic communities. It may be true in the large metropolitan cities of the world that office employees who work downtown will choose to live downtown to limit their commute time. In Saskatoon and Regina, where you can still get almost anywhere in the city within 20 minutes, it is simply not a factor. The opinions expressed here are my own and do not necessarily reflect the beliefs of ICR Commercial Real Estate General Partnership.